A team from Lawrence Berkeley National Laboratory (Berkeley Lab) and Lawrence Livermore National Laboratory, both U.S. Department of Energy (DOE) national labs, is leveraging powerful supercomputers to portray the impact of high-frequency ground motion on thousands of representative different-sized buildings spread out across the California region. Their work – part of DOE's Exascale Computing Project – is important to showing how different seismic wave frequencies of ground motion affect structures of various sizes. Lower-frequency ground motion is known to affect larger structures and is easier to replicate by computer simulation. Small structures like homes are more vulnerable to high-frequency shaking, which requires more advanced computing to simulate. The researchers are presenting three scientific papers describing their recent simulations at this week's U.S. National Conference on Earthquake Engineering (NCEE), a meeting held every four years by the Earthquake Engineering Research Institute. One simulation was run last week using the Cori supercomputer at Berkeley Lab's National Energy Research Scientific Center (NERSC) to simulate high-frequency (5-hertz) ground shaking. "Historically, seismic experts have used empirical evidence from previous earthquakes to assess earthquake hazard and risk at regional scale," said McCallen. "While important, data about ground motion characteristics and resulting structural damage extrapolated from an earthquake that occurred halfway across the world are only so helpful to improving our understanding of how well our California infrastructure could endure seismic stress." Because it runs through the East Bay, the most populated subregion of the San Francisco Bay Area, the Hayward Fault is considered one of the most dangerous faults in the United States. The fault hasn't generated a major earthquake since 1868, a source of concern for experts who cite evidence supporting the idea that the East Bay fault is overdue for a major earthquake. The national lab researchers leveraged Cori's supercomputing power to simulate ground motions at a broad range of frequencies, which are then used in a second computer program for building response, to quantify seismic risk for representative building structures on a regional scale. A total of 9,600 structural dynamic simulations were employed and analyzed to study the risk variation on a 100-kilometer by 50-kilometer domain for two events: one at magnitude 6.5, and another at magnitude 7. A critical factor affecting earthquake damage to buildings and structures is seismic wave frequency, or the rate at which an earthquake wave repeats each second. Because of this, researchers including Livermore Lab's computational scientist Anders Petersson and seismologist Arthur Rodgers have been working with Berkeley Lab's Hans Johansen to advance the existing SW4 code. This code was originally developed by Petersson for simulating three-dimensional seismic wave propagation. "While working closely with the NERSC operations team in a simulation last week, we used essentially the entire Cori machine – 8,192 nodes, and 524,288 cores – to execute an unprecedented 5-hertz run of the entire San Francisco Bay Area region for a magnitude 7 Hayward Fault earthquake. The run was executed in 9 hours and 11 minutes of wall clock time," said McCallen. "The code developments necessary for this run are moving us toward our ultimate goal of a full exascale application." 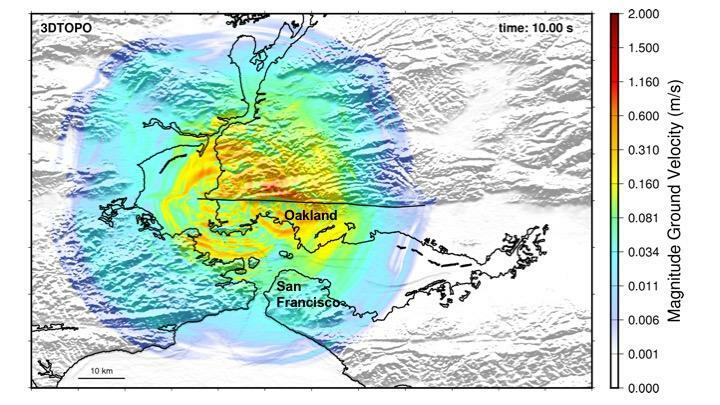 The fact that buildings respond differently to certain seismic wave frequencies based on their size was evidenced by the most recent simulations of high-magnitude earthquakes along the Hayward Fault. These showed an increase in damage potential for the 40-story building – more than for the three-story building – as the earthquake increased in magnitude from 6.5 to 7 at 5 hertz due to the significant increase in ground motion at longer periods of vibration. Other results indicate that ground motion and the potential for structural damage could vary between sites in relatively close proximity. Without the NERSC computing resources making it possible to execute these earthquake event scenarios for so many locations and structures at such high resolution so quickly, it would not be possible to produce such accurate site-specific depictions of structural risk. The researchers believe that such precise physics-based representations of the potential for damages will ultimately provide a more accurate and complete picture of the interaction between seismic ground motion and structural damage. "Simulations can both increase understanding of and reduce uncertainties about the very complex processes at play in earthquake science and engineering," said McCallen. "It's become clear that our ability to accurately assess earthquake hazard and risk at regional scale can benefit from physics-based simulations that allow us to depict the impact of seismicity on site-specific ground motion and structures in the areas most vulnerable to these potentially devastating events." "It is an exciting time for the science and engineering communities. Through DOE's Exascale Project, we will be developing the computational ecosystem and gaining access to computers that are big enough and fast enough to execute these types of computationally intensive calculations," he added. The research was funded by the Department of Energy's Office of Science. NERSC is a DOE Office of Science User Facility.